Welcome to special Artisan Design Team Blog Hop. 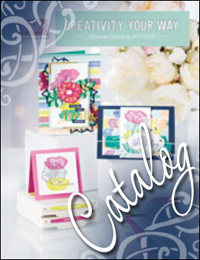 On this hop, we are featuring the Snowflake Showcase Promotion featuring exclusive stamps, dies and accessories. Customers can purchase this fantastic bundle, November 1-30 or while supplies last. We were asked to create two projects...one with just stamps and the other using stamps and coordinating dies. Some of the team are featuring the Happiness Surrounds stamp set (#149744) while others (like me) are featuring the Snow is Glistening stamp set (#149742). My first card focuses on the stamp set. I just love snowflakes and the snowflake images in this set are great. I stamped a piece of Wood Textures DSP with VersaMark ink and then heat embossed everything with White Embossing Powder. Then I just added some linen thread and some clear rhinestones for a great country Christmas card. For my second project, I stayed with the country Christmas theme and stacked several layers of die cut snowflakes from the largest snowflake die in the Snowfall Thinlits set. The top layer was cut from Wood Textures DSP. I used the two largest snowflakes from the Snowfall Thinlits Dies and layered them for even more dimension. For the sentiment, I die cut a circle using the Stitched Shapes Framelits dies(#145372), stamped a Pear Pizzazz snowflake in the center and then stamped the word "Joy" in Early Espresso ink. Welcome to very special Artisan Design Team Blog Hop. On this hop, we are featuring the Blended Seasons Bundle featuring limited-time products only available until August 31 while supplies last. The Blended Seasons Bundle is perfect for crafting in any season, in any part of the world! The bundle features the beautiful Blended Seasons Stamp Set, coordinating Stitched Season Framelits Dies and the beautiful new Watercolor Pencil Assortment 2, including some of Stampin' Up! 's brand new colors! I decided to explore different ways to use the watercolor pencils other than the obvious ones. For these vibrant flowers I first colored them with a base layer using a Light Cherry Cobbler Stampin' Blends marker. I know that seems a little like cheating, but I think of it as using your pencils to their fullest potential. Real Red Stampin' Blends are on the way, but until then I was able to layer Real Red watercolor pencil over the markers to brighten them up a little. Then I added shadow using the Cherry Cobbler from the new Watercolor Pencils Assortment 2. I did the same thing with the leaves except I started with the Light Old Olive Stampin' Blends and then layered Garden Green watercolor pencil over top. The key is to color lightly and then continue to build color until you get the look you want. Take your time...it works best if you let the pencil layer "rest" for a few minutes between layers. The end result is different than either coloring medium alone. Together they make a great pair. I literally cut the sentiment in half and then stacked the greeting for a different look. This is a great way to extend your possibilities and you can always line it back up the way it was intended. For the card base I used Real Red cardstock (#102482) and added some fun plaid from the Under the Mistletoe DSP (#146921). I used the two largest Stitched Season Framelits to create frames. I cut one from Basic Black cardstock and one frame from Whisper White. I love how these framelits add stitching to the inside and the outside of the frame. Welcome to another Artisan Design Team Blog Hop. On this hop, we are focusing on the Broadway Bound Suite on pages 68-69 in the 2018-2019 catalog. I don't know if I would have purchased this set, but now that I have it, I am head over heels in love with it. I have had more fun playing with this suite and even though it isn't my typical style, I am smitten. I made two different cards for this hop. I was inspired by the retro signs of the 50's and I just had to build on that idea. Everything on this card is from the Broadway Bound Suite except for the new Silver Glimmer Paper (#146960) and the dies I used to cut the stars (Starlight Thinlits #141840). I was so convinced that these stars needed to be included on these cards, that I drove all the way across town to borrow the dies from my best friend, Nancy. It was worth the trip! They are now at the top of my wish list! I love that the Broadway Lights Framelits Dies (#146317) in this suite work with the Broadway Bound Specialty Designer Series Paper (#146277). I cut the party hat from the DSP with the hat die and it works perfectly. If you take the time to study retro signs, the arrow is such a popular element. For this next card I freehand cut the large silver arrow behind the sign. I also used one of the stars that I die cut with the Starlight Thinlits to accent the "i" in Wish. It makes a big impact to the finished card. Who would have thought that a Christmas star die would work so well with this set! I used the Classic Label Punch (#141491) to cut the ends of the sentiment strips. One final detail...the Metallic Pearls (#146282) work wonderfully with this suite. I thought about using rhinestones or white pearls, but the silver metallic pearls really do look better and add an extra touch of realism to the card. Our theme challenge this week at Global Design Project is Love It-Live It-Share It. Basically, we are supposed to share some of the things we love about stamping and Stampin' Up! One of the things I love about Stamping is the versatility you have to create something you love. It never ceases to amaze me how you can take the same images and arrange them in different ways to get completely different looks. I didn't really intend to have a tropical inspired card for this week, but it is just the way things came together and I couldn't be more thrilled. Last week I used this exact same configuration of stamps from the Falling Flowers stamp set (#139556) and achieved a totally different look. Another thing I love about stamping is coloring. I adore the Stampin' Blends markers and I am thrilled that there will be several new colors coming soon. I was completely amazed that I could pair this stamp set with a sheet of the Share What You Love DSP and get this bright and colorful birthday card as the end result. I also love that I can color my pearls with the Blends...oh so versatile! Oh, and in case I haven't mentioned it...I love my Big Shot and cutting dies. Here, I die cut several Happy Birthday thinlits (#143700) in Whisper White cardstock and layered them to create the look of chipboard. Our theme challenge this week at Global Design Project is Christmas Joy. I have mentioned a few times that I play clarinet in the church orchestra and I also love to sing, so it probably doesn't come as any surprise that I adore the Merry Music Specialty DSP in the 2017 Holiday Catalog. Many of the designs are sheet music from some of my favorite Christmas songs, so I decided to focus on the paper for this week's challenge. First I made a bag with the Mini Treat Bag Thinlits and a piece of dsp that features the lyrics to "O Come All Ye Faithful". This paper is the perfect weight for the treat bags, but I needed a little reinforcement for the stars. For the largest star I used the dsp that features "We Three Kings". The chorus of the song is "O, star of wonder, star of night, star with royal beauty bright, westward leading, still proceeding, guide us to thy perfect light." The smaller star features the song "Cantique do Noel" which is French for "O Holy Night". Hopefully it is clear where I got my inspiration for the star embellishment on this project. I die cut a silver glitter snowflake for the center of the star using the Trim Your Stocking Thinlits Dies. I think it looks like the beams of light radiating from the center of the star. To give the star a vintage look, I sponged everything with Early Espresso ink and clipped it to the bag with a small clothespin. I love that the person receiving this gift can also use the star as a tree decoration as well. For the past several months I have been so busy making things for the Artisan Design Team that I had little time for anything else. I made this card for an Artisan project, but then realized that I was supposed to make a Christmas project and I had to re-do my blog post. With Thanksgiving only a few days away I thought I would share it here before it is too late. I absolutely love the new Stitched Layers Framelits. I especially like the way they give every project an extra special look and feel. I have made pumpkins using ovals for many years, but the stitching on the edges of this is perfect. The Petals & Paisleys DSP is just right for this card. Notice how I added some "real" stitching to the background layer to re-emphasize the faux stitching on the pumpkin. I stamped and embossed the sentiment from the Suite Seasons stamp set and the vines were die cut with the Flourish Thinlits and make this card over-the-top adorable. I wish you and your family a very special Thanksgiving!